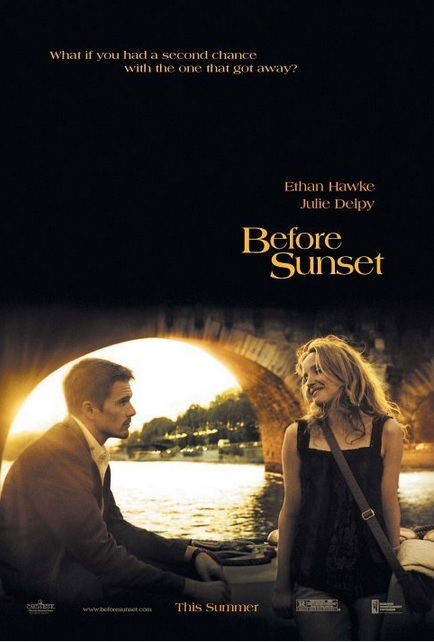 Spent another Thursday evening watching an old movie, and I did choose the sequel to the last one I watched – Before Sunset. So this movie is set nine years after the last one, with the same characters and the same actors playing them. Amazing how they really did do the movie nine years in real life after. The characters did really age naturally. And after nine long years, it was finally revealed that they never got to see each other again six months after their beautiful first encounter. The story set their second encounter. He has written an entire novel based on what transpired between them nine years ago. He tours Europe with his book, and does his last stop in Paris. She finds out about the book and realizes that it was written about their one night together, she shows up at his book signing event. They spend the entire afternoon together. I would say that the entire movie is like an entire afternoon full of half-a-lifetime worth of conversation. Everything that was left unsaid for almost a decade finally poured out in every moment and minute of this new encounter. I love this movie much more than the first, because it captured one complete, continuous, flowing conversation of two people who have waited for so long to see each other. I do love the ending too, because it is left open ended again – you can never tell if they kept in touch after then. Perhaps I’ll find out what happens in the future when I get to the third installment of the series. This movie stirred up different feeling in me this time. I miss having long, never-ending conversations like this. It’s a treasure to find people with whom you can spend long hours, even an entire day just speaking with, and not ever getting tired or bored, or running out of things to say. I miss being with those people who I can spend time with like this. Has it been so long that I can’t even recall right now the exact people I have spent time with like this?